Dynamic Research, Inc. (DRI) has specified, designed, fabricated, installed and conducted evaluations with Automatic Vehicle Controllers (AVC) for a variety of vehicles, including automobiles, light trucks, SUVs, all terrain vehicles, and motorcycles. An AVC is a device for automating any or all of a vehicle’s control functions in a prescribed manner. 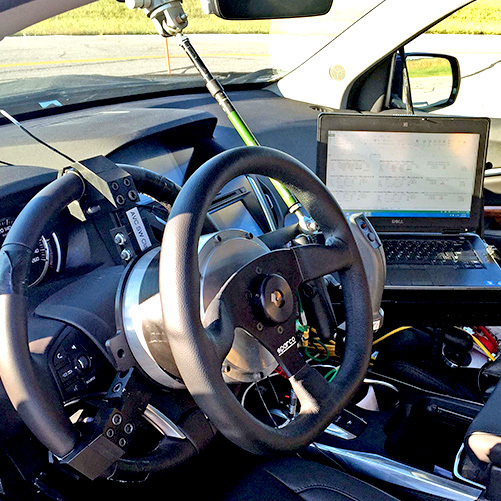 They range from devices that control one particular vehicle input, such as steering (as pictured above), to fully remotely controlled vehicles, in which steering, braking, acceleration are all controlled to perform a particular maneuver. Inputs can be simple or very complex, including waveforms which are difficult or impossible for human drivers (e.g., sinewave sweeps), or on the other hand, typical of human drivers.